A man has been arrested on suspicion of robbery after a worker was threatened with a hammer in a supermarket. 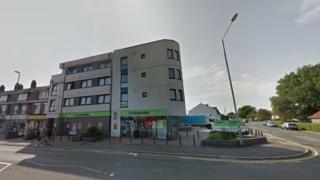 The offender entered a Co-op store in Seaside, Eastbourne, at about 20:50 GMT on Saturday and threatened a shop assistant to hand over some cash. A 29-year-old man from Eastbourne, East Sussex, has since been arrested. Sussex Police said the case might be linked to an attempted robbery nearby, an hour earlier, involving two men with balaclavas at the Seaside Newsmarket. On that occasion the men failed to steal any money. Det Sgt Graham Farmer said the suspect in the Co-op robbery was about 5ft 10in (1.7m) tall and had a dark blond or ginger beard. He was wearing a blue hooded top, denim jeans and grey trainers with white soles and was carrying a dark-coloured back-pack. Anyone who saw a man in the area matching this description is asked to contact police.